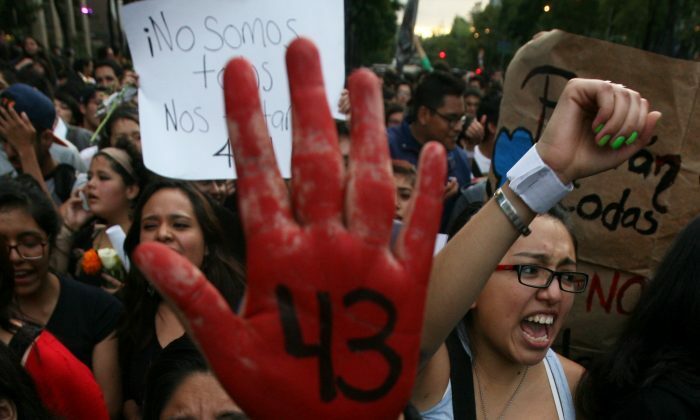 The night that 43 teachers’ college students from Ayotzinapa, Mexico, disappeared was a terrorizing one, according to a report released on April 24—which also showed evidence that some key suspects were tortured by police after the disappearance. The students have not been heard of since they were taken by local police on September 2014 in Iguala, Guerrero. The Inter-American Commission on Human Rights expert group says 17 of the estimated 123 suspects arrested in the case showed signs of beatings, including dozens of bruises, cuts, and scrapes. One of the suspects was nearly asphyxiated with a plastic bag, while another was slapped on the ears so hard his eardrums broke and his ears bled. The Mexican government recently released documents that suggest investigations were launched against police and military personnel, but officials did not answer requests about whether anyone had been arrested or charged. The report was released in front of family members of the missing students. No high-ranking officials attended the panel. Eber Betanzos, Mexico’s deputy attorney general for human rights said officials were investigating complaints filed by 31 people who claimed they had been tortured. He said six criminal cases had been opened, three of them involving employees of the attorney general’s office. The government’s version of events claims that corrupt police handed the victims over to drug gang members who killed them and burned their bodies at a trash dump. The corrupt police then tortured some of the gang members into confessing. “It is a lie the way they said they caught us,” Patricio Reyes Landa, a gang member, said in testimony in the report. “They went into the house, beating and kicking. They hauled me aboard a vehicle, they blindfolded me, tied my feet and hands, they began beating me again and gave me electric shocks, they put a rag over my nose and poured water on it. They gave me shocks on the inside of my mouth and my testicles. They put a bag over my face so I couldn’t breathe. It went on for hours,” he said. Meanwhile, experts complained the government lagged in delivering some of the evidence it had requested. The group also criticized government prosecutor’s investigations, and suggested the government was doing whatever it could to hold on to their version of what happened in September without looking into possible participation by federal police and the Mexican army. The report also denounced the forensics process of human remains and evidence of fire at a garbage dump in the town of Cocula in the state of Guerrero, saying officials had little proof a big fire could have taken place there. Only one body out of the 43 missing students was found there. The report said the roadblocks that were set up on highways in Iguala on the night the students disappeared were way more extensive than initially thought. They were allegedly organized by the drug gang Guerreros Unidos to trap enemies. The cartel may have believed the students were part of a rival organization. According to the report, local police surrounded the bus in which the 43 students were travelling, and detonated tear gas, flattened the tires, and told the aspiring teachers to get off the vehicle. “We’re going to kill all of you,” the officers warned, according to the bus driver, while another police officer pointed a gun to the driver’s chest saying, “You too,” according to the New York Times. The students were on their way to a protest in Mexico City commemorating a student massacre in 1968, and had stolen some buses for transportation—which is not uncommon and is tolerated by companies and officials. Students would usually steal buses and return them after events. “All of us were happy, having a blast, relaxed, happy with the drivers, playing,” a student testified, according to the report. Testimonies from survivors, government security officials, and other witnesses made up the report. Aldo Gutiérrez, one of the students, was shot in the head. The first emergency call was made at 9:48 p.m. While students tried to help Gutiérrez police officers shot at them, wounding another student’s hand as a bullet cut off several fingers. As he tried to protect himself behind a vehicle two policemen ran to him and beat him. A third student was shot in the arm. Paramedics were able to take three injured students to the hospital, while another one was taken for medical attention after suffering an asthma attack. “They all felt confusion, terror, and helplessness,” wrote the panel about the night of the attack. At around 10:50 p.m. students were taken away in six or seven police cars. Besides the students, other seemingly random killings took place in the same night. The report said a group of high school soccer players were heading home at about 11:15 p.m. On the road, 7 miles outside the city of Iguala, gunmen opened fire on the bus. One soccer player and the driver were killed. Passing cars were also fired at, killing a 40-year-old woman in a taxi. According to the report, witnesses said the gunmen included policemen, and ballistic tests found that some of the weapons used belonged to the Iguala local police department. Meanwhile, the students who hid from police and were not taken with the other 43 students began to emerge from their hiding places at about 11:00 p.m., after the police left. The students attempted to record evidence of the shooting, while trying to get in touch with their classmates. A little after midnight, a spontaneous news conference had just begun when three men jumped out of their vehicles and began shooting, killing two young men. Hours later, the body of another student, Julio César Mondragón, who had been at the news conference was found with his facial skin and muscles torn away from his head, while his skull was fractured in several areas, and with damaged internal organs. The report also noted that one victim sent a message to his parents from his mobile phone hours after he had supposedly been killed. The U.S. State Department commended the group of experts for their investigation. “We trust the Mexican authorities will carefully consider the report’s recommendations, evaluate suggested actions to address the issue of forced disappearances, provide support to the victims’ families, and continue their efforts to bring the perpetrators of this terrible crime to justice,” said spokesperson John Kirby in a statement.